Only 40 days to go before the 2018 IFBB season starts! The road to greatness starts here!! Only 40 days to go before the 2018 IFBB season starts. 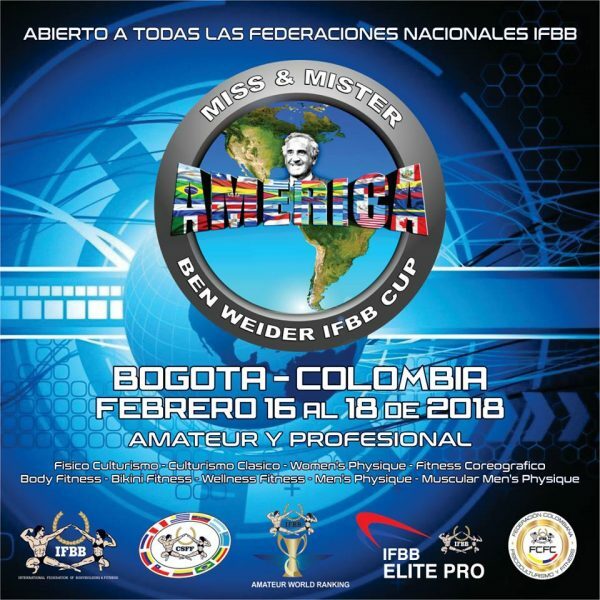 The competition will be in Bogotá(Colombia), with the Miss & Mister America Cup 2018 on the 16th to 18th February 2018 . A qualifying event for the World Ranking and open to athletes from all the IFBB-affiliated National Federations. The competition, which will distribute $US 20,000 in cash prizes; it will also award up to 22 IFBB Elite Pro Cards and a very special gift: the plane ticket for the overall Bodybuilding champion to participate in the Arnold Classic Brasil 2018 to be held in Sao Paulo, from April 20 to 22. Points are also awarded for the World Ranking (7 points for the winner, in every category) and as well during that weekend a course for South American national judges is being offered.